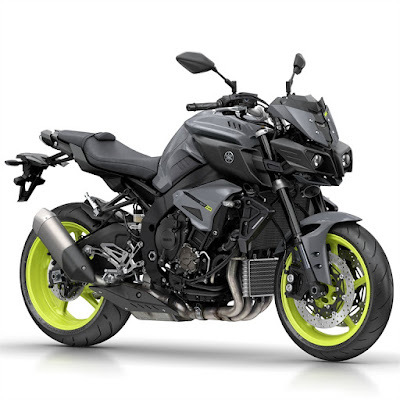 The Yamaha MT-10 is a standard motorcycle manufactured by Yamaha since 2016. It was introduced at the 2015 EICMA in Milan, Italy. The crossplane engine is based on the 2015 YZF-R1 but retuned for stronger low to mid torque. It produces 118.0 kW (158.2 hp) @ 11,500 rpm and 111.0 N·m (81.9 lb·ft) @ 9,000 rpm. 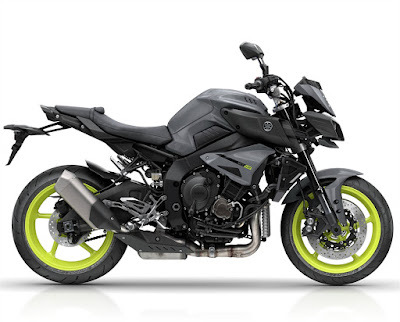 The bike with V-Max-like air scoops replaces the fourteen-year old FZ1 and the preceding MT-01 as the flagship bike in Yamaha's MT range. In October 2016, Yamaha released the 2017 MT-10 SP, which includes upgrades such as Öhlins electronic racing suspension derived from the YZF-R1M, full-colour TFT LCD meter panel, and an exclusive color scheme.